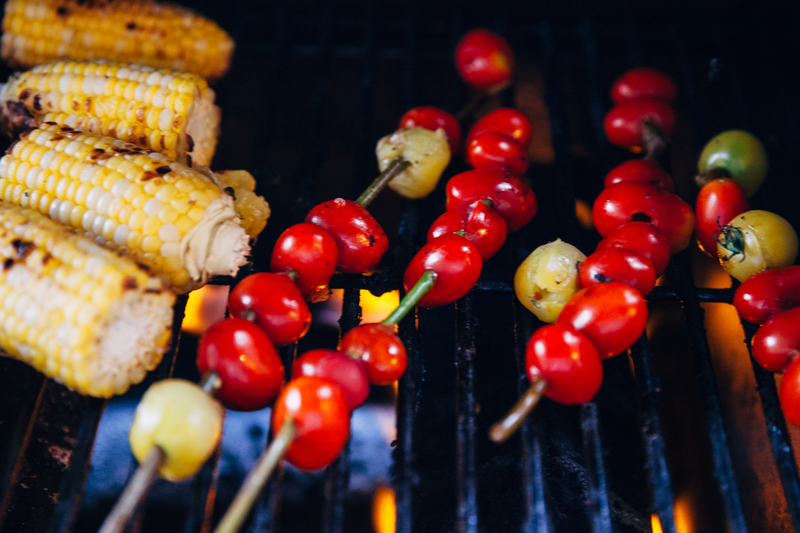 A cookout is synonymous with summer but not all of us are well-versed on how to create a restaurant-quality meal over a campfire. We tapped Chef/Partner Jeff Mahin (Stella Barra Pizzeria, Summer House Santa Monica), who not only shares his secrets, but gives us his ideal summer cookout menu. 1. Prep as much as you can ahead of time. 2. 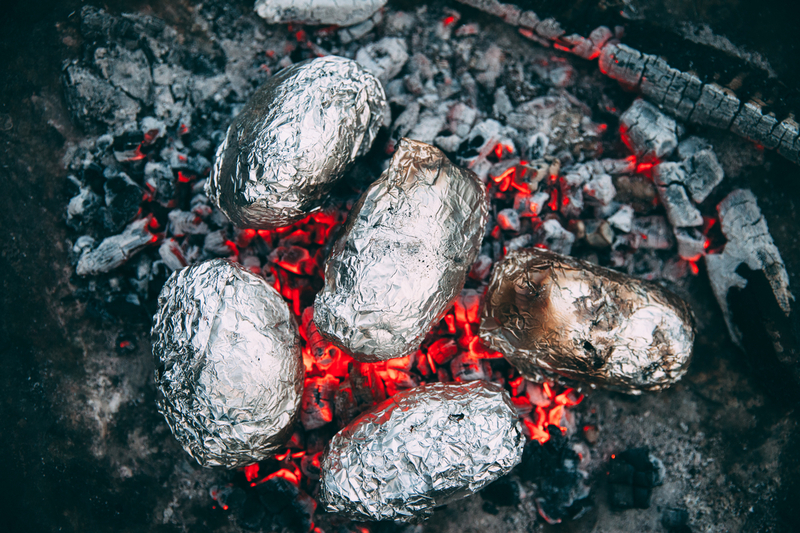 Re-heat by wrapping your food in tin foil and burying it in the charcoals. 3. Bring napkins and eat with your hands; this could get messy. Chef Mahin walks us through the menu. Ready, set, get cookin’! 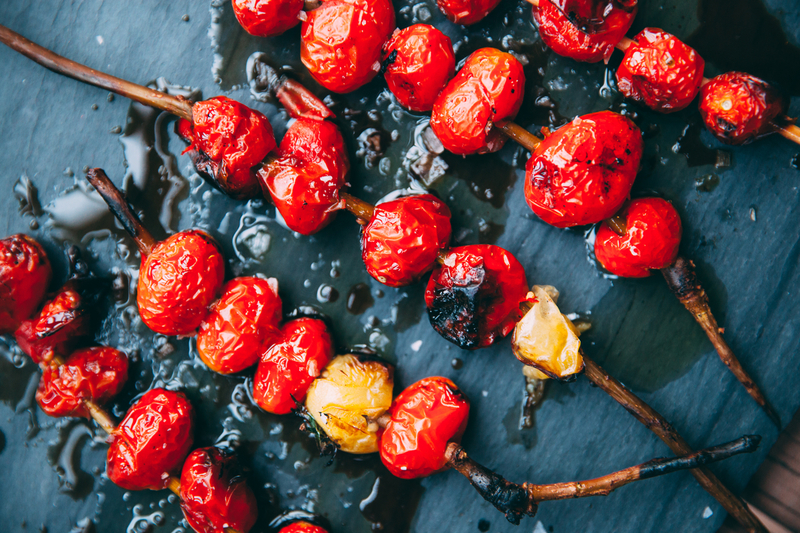 Summer is tomato season and this dish is not only super simple but a tasty way to woo your campfire crew. Find a durable stick or tree branch – living branches work better as they have moisture and won’t burn. Roughin’ it? For the outdoorsy-type, find a branch and use your 12-inch bowie knife to chop it away from the tree. Widdle down the branch to remove the outer layer and smaller branches – again, you want this to be as straight as possible. To assemble: Skewer the tomatoes one by one on the branch – that’s it, you’re done! Told you it was easy. 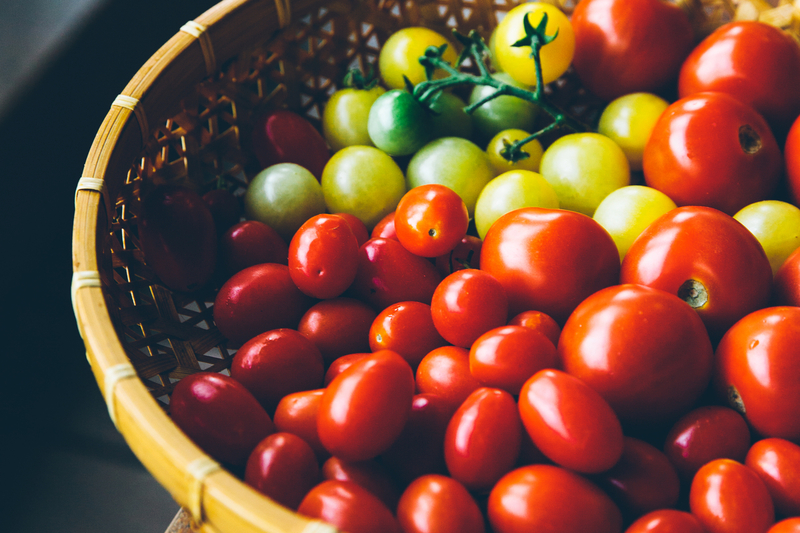 To cook: Place the tomatoes over the fire until they start to blister – the skin should char just slightly and this should take no longer than one minute. Once the tomatoes are cooked, remove from the flame and generously coat with olive oil and fig vincotto, then dust with sea salt. For the full recipe for the tomato skewers, click here. Wrap the potato in tin foil and throw into the ashes of fire. Keep it in the coals for about 30 minutes. The tin foil won’t get too hot but still be careful when pulling out the potato from the fire. We suggest pulling it out with long tongs. 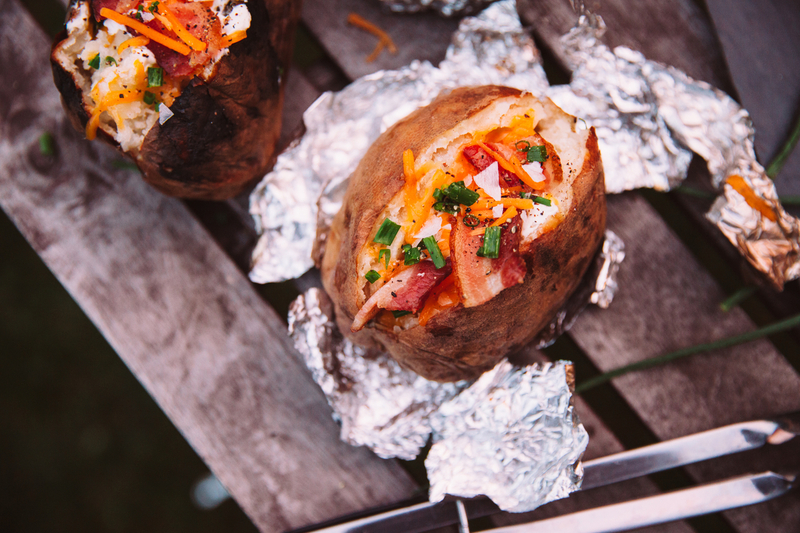 Set up a baked potato bar with your favorite toppings. Chef Mahin recommends sour cream, your favorite cheese, fresh chives and bacon. 1. Remove husk and cut the corn in half horizontally. 2. Skewer the corn with either metal skewers or thick wooden skewers. A quick tip: Soak the skewers in water overnight which will prevent them from burning. 3. Blister the corn over the fire until it is steaming and plump. 4. Remove from fire and place on a plate. 5. Cover with lime juice, butter, espelette, crumbled cotija cheese and cilantro. 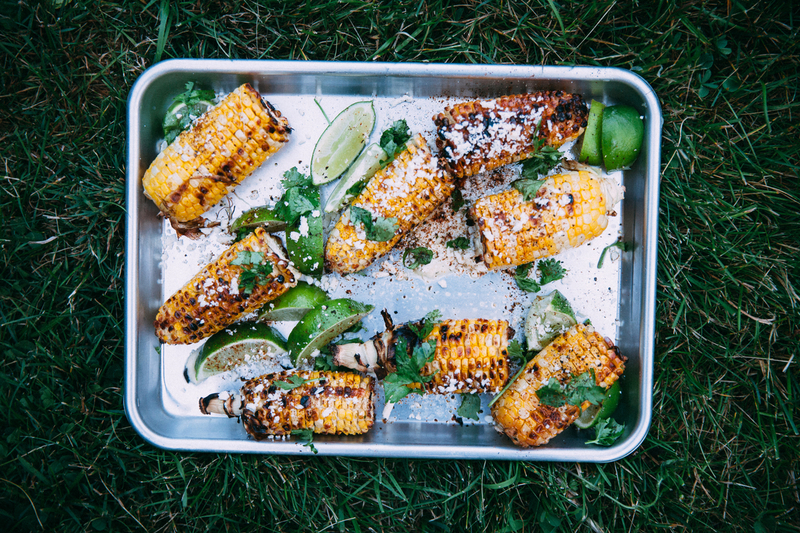 For the full recipe for charred corn on the cob, click here. The campfire is nature’s way of re-heating your food. Chef Mahin recommends you prep your rack of ribs at home, rub them with your favorite BBQ sauce then wrap them in tin foil. 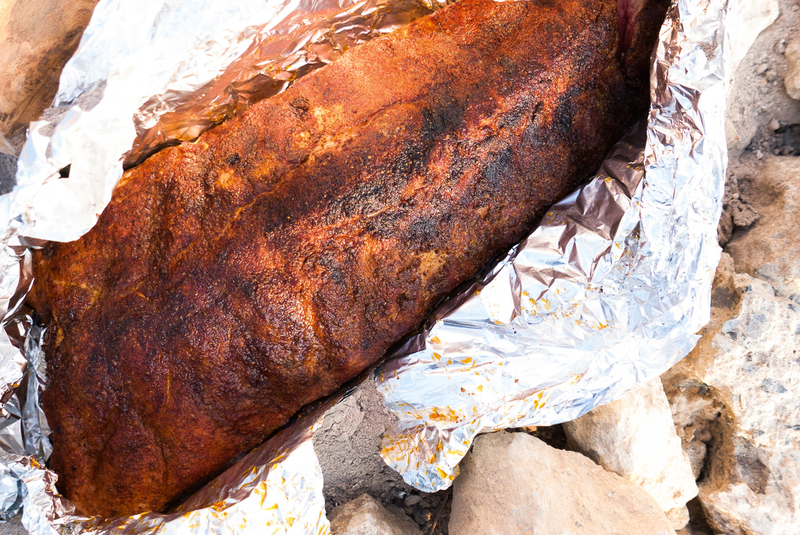 Put them in a cooler and when you get to your fire pit, scoop some embers on top of the tin foil wrapped ribs. Re-heat for about two hours. For Chef Mahin’s full rib recipe, click here. 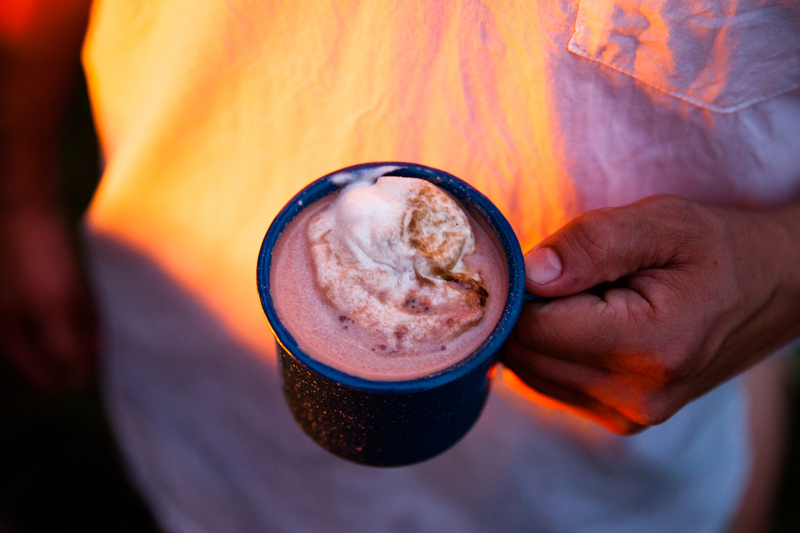 For a sweet finish, take your favorite hot chocolate mix and heat over the fire until it comes to a slow boil. 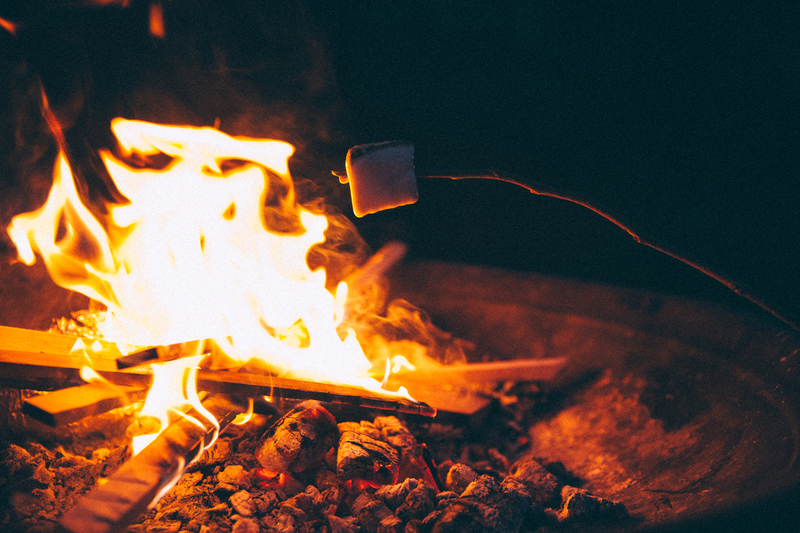 While it is warming up, toast a marshmallow over the fire to top your drink. This adds both a nutty and smokey flavor to your cocoa. Add a shot of Rumchata or Bailey’s to give your hot cocoa an extra kick!